Modern projectors are used to display the image on a special surface. Usually this method is used to increase the size of theimage and that very when displaying presentations in larger rooms. If you need to connect the projector to the TV, you need a device with certain features. In this case, refers to a projector that is able to transmit the video signal. 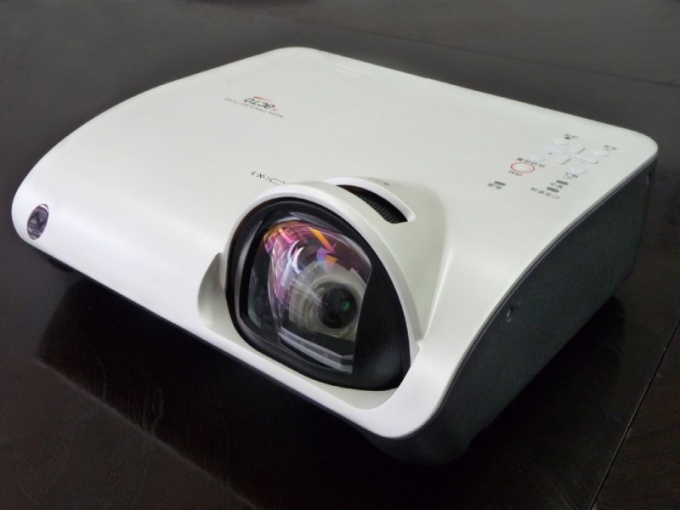 Of course, if you are using a projector that is not able to read information from hard disks or other media, then first connect it to your computer. You should get the following diagram: PC -> projector -> TV. Select the connector of the video card, through which you can connect the projector to the system unit. It is better to use a digital channel such as HDMI or DVI-D. of Course, the projector must attend the appropriate port. If not, use the VGA channel. Purchase the appropriate cable and connect to it via computer video card to the projector. Now select the connector that you will connect the TV with the projector. Modern TVs have VGA and HDMI channels. Rare that you see the video input is DVI. Get the right cable and connect it using the correct device. Turn on the TV and enter the main channel signal. Configure the settings for the synchronous operation of the computer, the projector and the TV. Open the settings menu screen. Press the "Find" button and wait for a determination of the second device. Select the equipment (computer monitor or projector), the screen will be the main. Activate the relevant function. Specify synchronous operation of the monitor with the projector. Given the fact that the latest device is connected the TV, it is better to use the function "Expand screen". Activate it and click the "Save changes". Now on the TV screen and the canvas of the projector will display an identical image, different from what is transmitted to the computer monitor.